39" heavy duty stainless steel dual joint arm, 50 watt head. Mounted on a 25" diameter base with five 2" casters, 14 lb. stainless steel weight added for stability and a 39" tall pole. Light has a 30 foot cord to transformer box (see warning below) 9.5 foot cord from transformer to wall outlet. 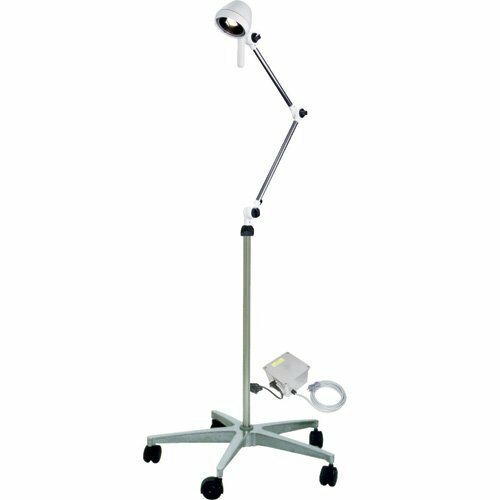 Certified as MRI Compatible, this unique examination light designed for use in any MRI facility is made of durable, MRI compatible materials. Warning: The installation guidelines must be strictly followed. The electrical box contains ferrous materials and must NEVER be placed close to the magnet. If the electrical box is moved closer to the magnet at 100 gauss line, electromagnetic interference may be seen, to avoid this NEVER move the electrical box close to the magnet. NEVER operate the light while the electrical box is unsecured. The lamp may slightly vibrate.